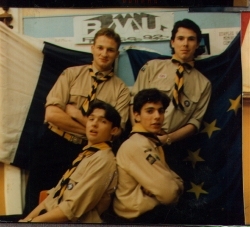 The is the documentation that accompanied the presentation for the 1992 Rowswell Venture Unit Summer Explorer Belt Expedition to France. At the time of the expedition, the authors of this log were members of the Rowswell Venture Unit between 17 and 18 years of age. The log is, as it was originally written whilst on the expedition, although some of the more colourful original text has been changed. With the benefit of a quarter of a centuries hindsight, I would say it reads too much a like a screenplay for an unmade Inbetweeners movie! The Planning was written by Jeremy six months after the Expedition Log had been completed. 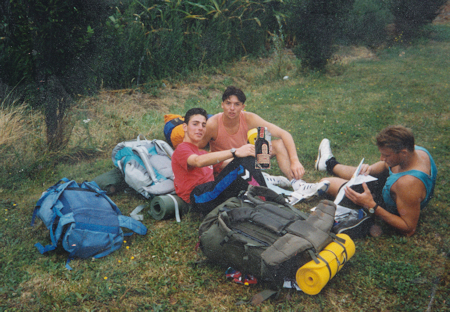 Tony handed me the Explorer Belt Award booklet and explained that the exploration needed to be abroad for ten days, in groups of two, answering ten mini projects and completing a large project of our own choice when we got back. Next unit meeting we asked our Assistant Venture Scout Leader for some advice on how to tackle our challenge-well, that was as worthwhile as asking a hedgehog to help a blind old lady cross the M25 on a pogo stick. We were on our own. I took the opportunity to gather some channel crossing brochures from Sealink, P&O and Hoverspeed and worked out that a large ferry was the same price as the new SeaCat Hydrofoil owned by Hoverspeed-Blue Ribbon. 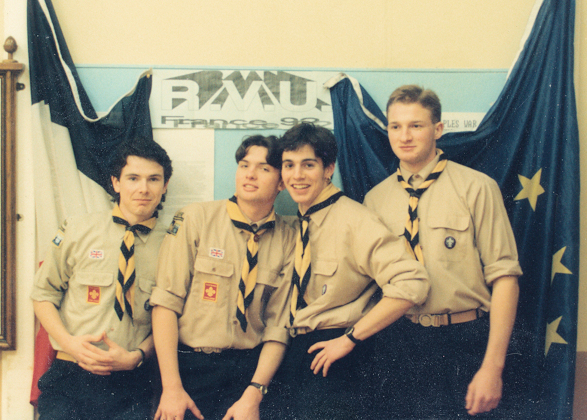 I then wrote to each company asking whether they would reduce our fare as we were students and undertaking an exploration under the Scouting name. Even Tony helped by writing a similar letter-but no chance "We have hundreds of letters from youth organizations asking us for discounts and we just can't oblige them all." Was there official reply. By this time we had decided on two routes. One was to start at Boulogne and work our way into France and up to Calais. 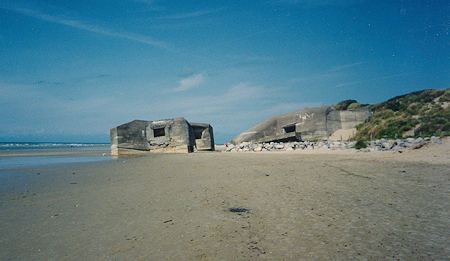 We would then return to Boulogne via the coast and channel tunnel entrance. This would give one of the pair a chance to do a project on the Channel Tunnel. 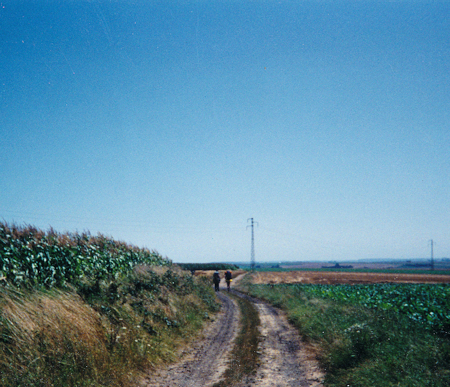 The second route was from Boulogne down to Abbeville taking an inland route and then returning to Boulogne nearer the coast. The projects being about the First World War and the land use around the Somme. I then ordered a map to cover both these routes on a 1:100,000 scale from the French National Geographical Institute. The 1:100,000 map arrived and when looking at the routes it was seen that the first route to Calais would be far too short by some 60km (37 miles). The second route was over the 160km distance by 19km but we decided to take this route anyway. A copy of a map but with the first route (to Calais) crossed out was handed to Tony who then handed it on to Gillwell and the man who was to set our surprise projects. We decided to plan a few practice hikes. Fortunately the Forest Boundary hike was soon. For this we had to hike 12 miles in 4 hours. In fact we completed it in just over 3 hours with well over 25lb on our backs. 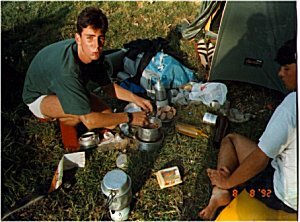 We had all had camping practice being on numerous camps and expeditions and due to the fact that Craig and Mark will have just come back from a camp in Wales with the Scout Troop in which they will have participated in numerous hikes. Also Andrew and myself will have just arrived back from a strenuous rugby tour of Canada in July; so we will all be fit enough. As well as this, I sent off for our insurance documents along with the correct sum of money. By this time I had phoned some map companies in London and obtained a leaflet on the maps of France as the 1:100,000 map would be too small a scale. I opted for Three 1:50,000 scale maps which would cover our route significantly. However when I rang the map companies again, a less than helpfull man on the end of the line told me that the 1:50,000 series had been discontinued. The next scale map down was the 1:25,000 map of which there are four of these to cover the same area as a 1:50,000 map. I was not a happy man. I then realized that we didn't need to buy all 12 as some did not contain our route but I still needed to buy 9 maps. Each map costing about £5 and including the 1:100,000 map also at £5 we ended up spending £50 instead of just £20. 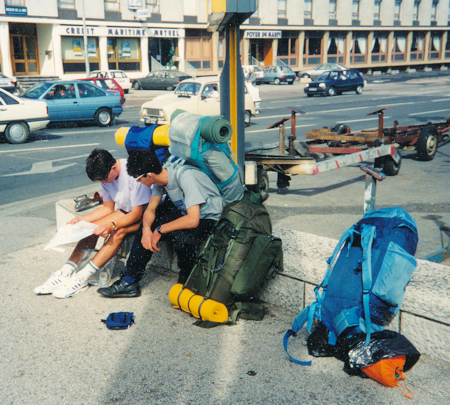 I had also found a "Campsites of France" book and located a suitable stop for each night. By June I had worked out the expenses for the journey and an equipment list (Including the equipment needing to be borrowed from our store). Even the boat tickets and the insurance documents had come through. The French money was on order and all we needed now was our surprise projects!! Andrew and myself had arrived back from Canada and Mark and Craig were back from Wales. We were now handed our surprise projects (and what a surprise that was!) The project for Andrew and I was handed to me on the day that I got back, two days before we were about to set off, so I opened it. The questions weren't too difficult but when I read the places that we were to visit, they said "Wimereux", "Sangatte", "Wissant" and "Calais". We weren't going to any of these places, we were going to Abbeville. I then phoned up Mark who also had this same route. After a fairly large worrying session we consulted Tony who told us to make up our own Questions as we went along- Excellent! we also decided to change our route slightly, making it the correct length of about 160km, which meant we didn't need some of the maps; which could have saved us some money- again I was not a happy person. 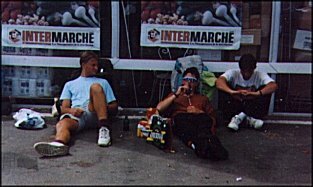 When I checked a photocopy of the route given to Tony it was plainly obvious that we were to go to Abbeville and not Calais and had they had checked the length of the Calais route they would have seen that it was 60km short. We did try to make the questions as similar to the original ones as possible. Any way, we carried on as planned until we nearly missed the boat as no-one had bothered to tell us that the SeaCat to Boulogne had been canceled and we were now going to Calais and then to get a coach to Boulogne. We finally arrived there an hour later than scheduled. NOTE R.V.U. MEGA MEAL NO. 1 IN A SERIES OF? ADELBODEN STEW (AS MADE IN ADELBODEN BY JEM, MARK ,CRAIG, AND DAN IN 1990) USED BY R.V.U. IN THE LAKES, EASTER 1992. FOR RECIPE SEE SWISS LOG BOOK 1990. TUES 4th big question muck up! On bus to Boulogne. The door makes an amusing noise every time it is closed. This is as fast as a hot steaming poo. It is a real used lavatory tissue of a bus. Craig is confused because we are on the wrong side of the road. Just seen Mac Ronald's sign and some people sand yachting. 9:25 BST Found lavatory+ tourist info. Their is an awful odor in the air but Craig swears it's not his vindaloo. In post office. Mahoocive Q's Andrew is megga unhappy. Sitting by road discussing which way to go. Andrew has his dosh and is happy now. Bologne is a smelly and Craig looks very bad. Sitting in ST. Etienne u mont Craig (Stan) is picking his nose. CD has acquired some lavatory roll from Mc Ronald. For some reason we all have to have nicknames. Mark and Craig were given Stan and Olly. Andy and Jem are Bill and Ben. 2:10 - We shouldn't have done this! We are sitting outside a grave yard. CD pulls some de odorant from his hair salon pocket. He's even got a hair stylist in their. Hack down the undergrowth out into field. err is this the right way? 4:?? BST Jem impresses us with his skill with the French language. We are at the site. 60F for 4, 12F each plus 12F for the site for one night at Verlinchen. Well here we are once again, 4 lads cooking again. R.V.U. Meal NO. 2in a series of ? Played table football with some French lasses. There were all four of us and only two of them. It was obvious from the start that we would win. But unfortunately they were experts and they thrashed us! CE EMBARRASSING! Lots of French girls here. Jem asks us to smell his finger and Craig exclaims that it's his holidays, he lights up another cigarette. Everybody is suffering from turbulence I.e.. wind. Going to bed, hope to be up early cause there are cockerels here and I bet the things wake us up! Lucky cockerels didn't wake me up or I wouldn't be responsible for Craig's actions. Showers are naff but I had a nice long one. (FNAR FNAR) anyway, Due to the fact that the thing is knackered and it irritated Andy for some strange reason as his showers are usually five times longer than anyone else's anyway. 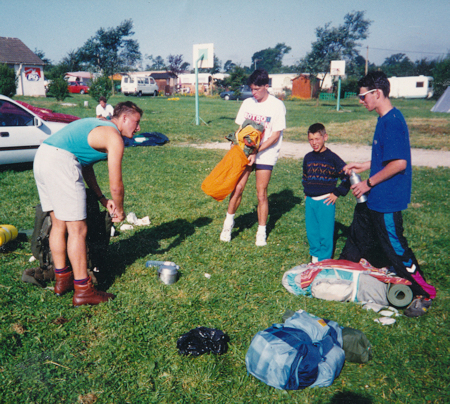 Mark's little friend helps Jem pack his tent. Craig chatted to a 15 year old girl with a big nose and no trousers. Beaky-no-pants. We are all dropping logs and Craig (Stanley) is going in for a second round. 11:20 is it a mirage? No! 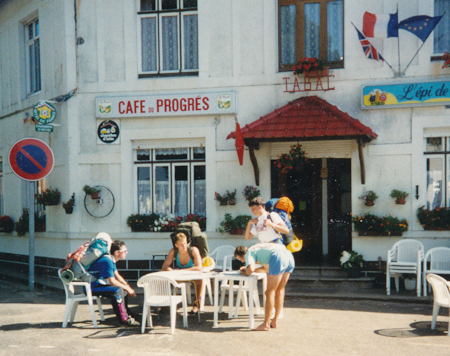 its the cafe du progress. Breakfast, another one for the R.V.U. menu book NO. 3 in a series of? JEM CARVES UP THE CAKE WITH A GIANT KNIFE. It doesn't go right up the hill, only to the top! JJ weds 5th wot a plonker! In Francq eating bread and nuttella sitting in playing field, very hot but wind helps. CD and AL took a short cut across a very large river. so they aren't here yet, GUTTED! Were not laughing. They turn up 1hr 10 min late and we all go four a swim in a green pool, met some Scottish people. CD and AL have gone to get the chips and are eating them all. R.V.U. mega meal NO. 4 in a series of? 1st draw silly faces on the eggs, then take eggs and milk but just a tad, mix up and fry. add the remaining ragu stuff from last night. Spotted a guy with very silly trousers. We are now frying a beetle in beer! He is what is technically known as knackered!!! CRAIG----I notice sherbet sauce is all the rage over hear. MARK----I've burnt my Spam, it hurts if I shrivel it up. Some Kid Filling Another Kids Trainers With Sand. There are two Jeramy Jacksons. Very Silly Trousers On hard NOT! Kid. THURSDAY (SCOUTS TONIGHT.) The weather is poor, all cloudy. 10:50 Andrew is chief bread cutter and Craig is dropping every thing. The butter tastes of ragu because that was what was in the jar before (LOVELY) The sky is clearing up and we are wondering why their is a union jack hanging on the green. Saw a statue of field martial Haig ( Black adder goes 4th) Craig says check the statue at bank London that was in Marks Monopoly quiz because it is very similar. The above explains the union jack. This green celebrates English French relations. Andy has an itchy rear end and Craig and Jem are plonkers. Beer is cheep in the super market. Gibbley Squat--Swear word of the week. * * * * * .5 stars! What does it look like? 4 blokes with rucksacks sitting on a traffic island. "Oh year we live on this island "
Now an English woman has just tried to go the wrong way down a duel carriage way. These foreigners should stay at home... oh hang on? We are going native! This bloke gives us a lift 5 miles the wrong way and gives us a brocheur with religious stuff in it. THEIR IS A WONDROUS VARIETY OF INSECTS OUT HEAR AND THEY KEEP LANDING ON ME. MH---Yeh. don't drink and dive! Were all talking rubbish like Pete so I'm going to draw a picture of the 2 girls over there. I think they are studying for their exams! Andy-----Why are we in the middle of France? Craig----If you look up in the sky its just like any where else. R.V.U. Mega meal NO. 5 in a series of? Well hear we are. Sun bathing and watching the Netherlandrical babes. The real thing mind, not the meal we named in their honor. I'm pretty board and I am reduced to catching Jiminy Crickets and spiders. Speaking of which their was a big one in our tent this mourning. He was so big that I though the camp warden might try and charge us for an extra person or at least a pet. Saw loads of shooting stars and satellites last night. Andrew has just started snoring. Craig woke him up and Andy realised he had a sweaty back. The Remains of little spider that dared to stroll over this sacred document Can Be Found in the Original. Last night Craig Skinny dipped in the pool. Just now all apart from lazy erm I mean Andy went swimming every one was amased at our butter fly. Jem swims under water and head buts the side. After lunch Jem set fire to the rubbish. Smoke that you could probably see in Gidea Park. NOT! Craig and Jem are discussing the pain involved in child birth. They have reached the worrying conclusion that men are Sods and have it made except for one thing. Now we are talking about grannies and Craig is talking about Household cavalry guards, standing to attention, Strange boy. R.V.U. Mega meal NO. 6 in a series of. NOTE 1 It makes a real granny of a meal. NOTE 2 Don't let jem cook because as he does he eats most of it. Solution--- The Trangia kettle is just big enough to fit a bottle in. You then pour water in through the spout. At present Jim is scratching himself and smelling his hand, he just asked me to smell it for him. Nice! Marks body is as white as a white fly (and I mean coconut) why doesn't he get some sun on it so he burns. This campsite is a messy bubble of a place but who gives a damn. 7.30 Come on lets get up! 8.00 are we ready for our long days walk? 9.30 coming up to wailly beaucamp after a long speedy walk with lots of camp songs sung. 9.48 Mark slips on a banana skin very funny. 10.20 Craig has licked a dogs tail Yum! 11.20 reach nemport st Firmin and cross a beautiful river. Jeramy falls in and swims down stream to catch a big fish in his mouth. 12.00 reach Vron and have lunch, some bread and jam- lovely. Andy cracks a joke about the song, You DO Vron Vron Vron You Do Vron Vron. We all have major hysterics. 1.30 Reach some little lakes, every one goes skinny dipping. 4.30 Went to bed with a glass of milk and a bicce. Ready for a early start next day. --- Their is a stupidly big thunderstorm coming. --- Has any one slept in a hurricane in the rain before. We are all sitting outside watching the mother of all electrical storms. After about 20 min of lightning the French stopped flying their kites. I rather fancied fried frog for my petit de jeurne. Neterlandic babes father comes out. He looks like Bob from the Fosters advert. Don't you just hate it when that happens? Someone gets their shirt off--some discussion to weather it was the babes or the dad! Craig's lost that loving feeling, woo that loving feeling. In Ponthile and it's so hot that water jem spilt evaporated in less than two minutes. WE HAVE MET A FRIENDLY LOCAL. Jem impressed him by not knowing what the hell he said. At camp site in Rue Andy and Craig left us to get food before they came to the camp site. The funny thing is that there is a large supermarket right in front of it Hee Hee. The Problem is that the place is full. What a large Bummer!!! Got a small place on lumpy ground. Strawberry Ice Cream For ever. Boy: Et le homme a la derrière. Well well what a night, guess who was the center of attraction last night. 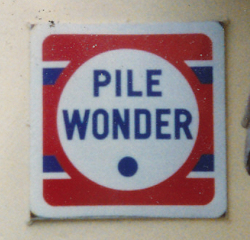 A site full of French. We are the only English. But they were all 7 year old Boys but not for long! The seven year old boys introduced us to their 13 year old sisters who introduced us to their 16 year old friends. THAT'S THE WAY TO DO IT! Got 8F 40 refund on bottles spent 6F on bread but woman on counter said she couldn't give me the extra 2F 40 so I had to get some Tic Tacs for 7F40 as they were the cheapest around. What a bummer of a money saver. It's lunchtime by a flooded sand pit, Lake thingy. Jem's gobs are so thick that they dangle from trees. The question everyone is asking is, why are the bagets limp? After walking up this path, myself and Jim walk over a field. anyway all is going well, Jem climbs over a fence by using a tree. The tree broke leaving Jim on his back like a beached whale. Then too take the mick, a farmer lets his randy bullocks into the same field . We had some trouble getting over the fence. 16 yards away and very annoyed Jim throws his bag over. AGHH the string caught on the fence. Bulls 5 yards away with lock on and closing, 4 yards Jim over the fence, leg over 3 yards!! . 2 yards new pants please. I'm free. Aghh no way out. After saying sorry to Jim for leaving his rucksack I throw it through the hedgerow, to make a path. Then he dots it with mine! Silly Quote no. ? in a series of ? Bully Les Mines 62160 France. R.V.U. Megga meal, No. 7 in a series of ? 7) Don't let Jem cook because he still eats it all. 8) Put quick pasta on- we used Italian GAZZOLA pasta appropriate don't you think, If you drop the o and l.
AL- It's OK it only takes 2 min. JJ- I keep putting my head on your bits. CD.- Talking of Dogs I need the toilet. The logs wet! Its raining and wear not getting up you carnivorous plonker! 1:25 Saw 2 donkeys being very friendly, Woman donkey was having none of it. 1:45 Saw sign and a wobbly one too. I'm not going to copy Jems master piece of the donkeys. Just saw two 7 year olds buy a crate of beer. Having lunch by another round about, Craig opens rucksack to find empty jar of jam. He finds Jam in ruck sac, and clothes and shoes and bed, He is excessively unhappy. Scrapes jam back into pot, we have just eaten it, Now have been moved off grass by bloke mowing it. CD- That runways not wide enough. What happens if a plane comes in side ways? Someone in the mini bus next to us has just broken wind 4 times and wrecked the Hurricanes. am I? oh God, really where am I, I'm not am I? French bloke thinks he's funny but he is not. Mark--So we're following the path along the dunes tomorrow. Mark--Year DUNES make you breath more easily. 2) Fry onion and then bacon. 3) Add Rague sauce, Make sure not to burn yourself. So here we are in this city. Nothing works here any more and what's more there is a camp warden who is very unhappy, don't know why. Well were just about to leave and theirs no one around. Ahh this is the life, lunch on the beach. We couldn't get the traditional chocolate AMINALS. Whoosh ---- zoom --- GRAA!! Flap -- flap here comes the flying plastic stega sorus. After a long walk we arrive at this naff camp site. We are amasingly knackered and have got knackered legs and blisters and what's more their is a caravan full of kids (4 tribes in one tent as usual) not 100m from here.. Came across the dunes today, shades of Lawrence of Arabia, staggering over the deserts, all we needed was camels and head bands. Came through a popular beach resort. Got some very strange looks. We were a bit out of place. People sun bathing and us with boots on and rucksacks, nearly got mown down by a cowboy in a sand yacht. He was really shifting! He managed to pull a sort of hand break turn. CD and AL did some dune diving, Mark had a go but jems feet hurt to much. The campsite is a real first class, A1, used pink toilet Role of a site. It's blowing a gale or is that just us breaking wind. No, no parp is that strong. Apart from the one I did earlier that shot sand in the air. Jem is being a pyro again. Craig owes mark a fiver. O dear that's the last he'll see of that!!! Dinner tastes naff because Jeremy cooked the spoon. 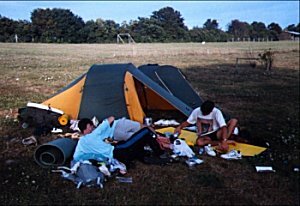 Don't leave any food in the tent because Andrew the sod eats it all -- --- cos Jem's a selfish bloke who doesn't share anything! 8:15 going to bed. Craig has been asleep four some time and that's not rubbish. I have just used a squat and shoot lavatory, It was unpleasant but it was worth it. 1:15 (am) Just had to re peg tent in dark, in gale because ground is naff! Its just dry sand and doesn't hold a peg. Plumbs! to the noisy kids. But we are all content ------not! Craig's run out off fags and is suffering withdrawal symptoms, swearing loads and shouting. Marks feeling sea sick just by looking at the sea and we're not getting the boat till tomorrow! It's 4:15 Craig and Jem have nipped off to get the food and it's really raining! Their back now and getting water all over the tent. Idiots! A big meal for 33 Francs plus 21 Francs for beer and onion 2 packets of soup and tin of mushrooms. find we are very wet. Now CD's being a plonker and pealing rappers off everything, Even the orange carton. At shop AL put his rucksack in dog muck and then his hand. Beta bag has poo on it, that's the one CD is shouting! AHA HA ! Saw a Saddam Husain look-a-like getting on the sea cat, saw northern bloke drop 4 crates of beer. Craig Bought Presents for his mum and dad, Champagne and boursin. WE WANT TO GET A DRINK! Ha ha, order 3 lagers. the lady pulls the beer draw open and oops the friggin draw snaps. Ha ha! Words cannot describe how I felt. I was O.K. until the second beer, then I was very much greener than Jem. If he was here he would have pueked. Why don't they let us off the boat, the sods, I need the lav and we are stuck on this boat and we are about 40 mins late, my old man will be well annoyed. Jame Jouer au lapin, et toi? Most died in Allied campaign of 1940. The six divisions of British expeditionary forces (BEF) which went to France at the outset in 1914, were deployed amongst French armies and played their full part from the 23rd of August in the Battles of Mons, le Chateau, Mame, Ausine. The next 3 weeks during which the battles were fought every day, were a highly critical period in which the German plan for ending the war at a stroke was foiled. 750,000 commonwealth soldiers in 1000 war cemeteries. The cemetery also contains the second world war burials of 112 British, 1 Canadian, 1 Australian, 1 New Zealander and 1 un identified, soldiers sailors and airmen most of whom died during the campaign of 1940 in air operations over France. 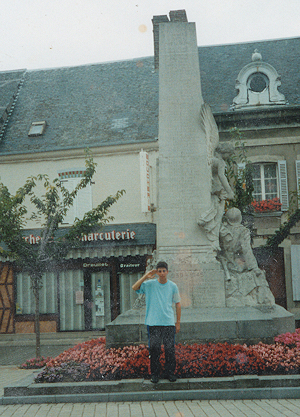 2) In Montreuil why is their a big union jack in the town square----To celebrate Anglo French relations. 7)Whats in land in etaples, That should be in the sea.? -- A Fishing Boat. 8) Find out information about war in etaples military cemetery. 9) Bring home a French national flag.